Kyle and I went home to Northwest IN with the pups to spend Christmas with my side of the family (we switch off my side and his side every years with Christmas and Thanksgiving). We had such a great time in the unseasonably warm weather. I wanted to share a great recipe my Pops and I whipped up together for Christmas Eve dinner along with some Christmas pictures! I apologize for not really having exact amounts but hey its Italian cooking we add a pinch of this and a pinch of that! 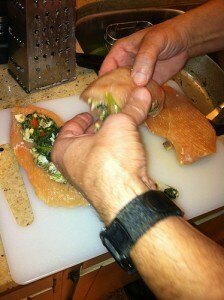 To start flatten the chicken breasts and leave to the side. Thaw out the frozen spinach in a pan on low to medium heat and when thawed out drain the excess water. While this is thawing chop up the garlic, mushrooms and red peppers fine. Add this chopped mixture to the spinach in the large pan and add a touch of olive oil. 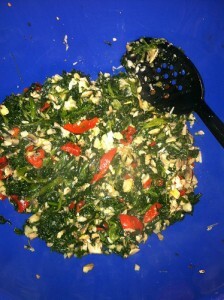 Also add in the seasoning, garlic salt and spinach to taste. Let all of this sauté for about 10 minutes on a low/medium heat. Place the mixture into a big bowl and add the pine nuts and grated triangle of cheese and mix together with a big spoon or even your hands. Next, get a fresh pan and put a touch of olive oil in it and set it on medium. While this is heating up grab your flattened chicken breasts and start spooning the mixture onto them. Do not fill them up too much because it will be hard to roll them. Roll them up and place a toothpick or two in there to hold them together (be sure to tell your guests to watch out for them). Once they are rolled place them in the hot pan and slightly brown the chicken, do not cook it. As these are browning you can make this simple sauce. Sauce: My mom has one of those magic bullet blenders, which are amazing! A regular blender will work just fine too. Puree the jar of roasted red peppers. Pour it into a bowl and add the Philadelphia cooking cream and a touch of olive oil. Stir it all together and add all the seasonings. As you will see the sauce is watery so add in flour to get it to a bit thicker of a mixture, not cream it should still be sauce like. In a large glass dish place some of the sauce mixture at the bottom. 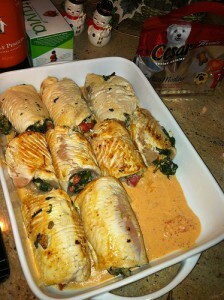 Place the browned chicken breasts in and add the remaining sauce onto the top. Place in a preheated oven at 350 degrees for about an hour or so. This time will vary greatly depending on how thin the chicken is, how much you browned them and so on so just keep an eye on it. These roll ups were a huge hit with our family and I hope your family likes them too!